Apple's online storefront reopened at midnight on Friday to accept Apple Watch preorders and sales of the new 12-inch MacBook, kicking off global sales of two hotly anticipated products. The Online Apple Store returned to service after going offline for Apple Watch preorder preparations Thursday night, but showed extremely limited availability for the device, with many models shipping in four to six weeks. Supply for Watch started out severely constrained, it appears, as the only models quoted to ship by Apple's promised April 24 date being the 38mm Apple Watch Sport and, for a few minutes, the 42mm stainless steel version. The 42mm Sport variant was quoted at four to six weeks out, the same dates currently applicable to the stainless steel Apple Watch lineup. Apple's rose gold Apple Watch Edition ships in May, while customers buying the yellow gold version will have to wait until August. MacBook supplies are less constrained and all configurations of Space Gray, silver and gold color schemes are shipping within one to three days. In-store Apple Watch previews kick off today at brick-and-mortar Apple Store locations and specialized boutiques around the world including colette in Paris, Dover Street Market in London and Tokyo, Maxfield in Los Angeles and The Corner in Berlin and select Apple Authorized Resellers in China and Japan. Reservations are already live in Australia, East Asia and Europe. Unlike Apple's most recent iPhone launch, preorders went up on time, though some users had to order through the Apple Store app instead of Apple's Web interface. 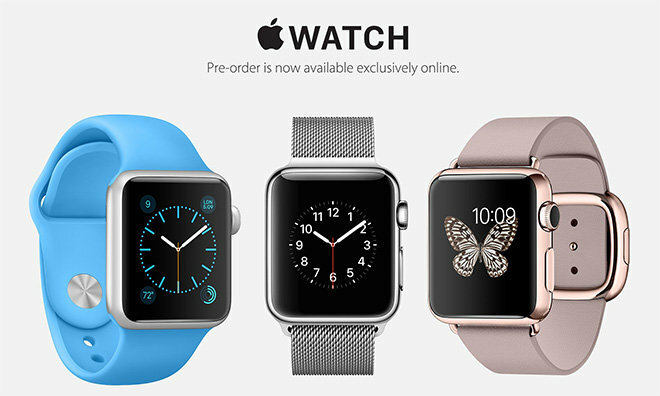 Those planning to buy an Apple Watch can read AppleInsider's preorder guide to get a handle on their options. Update: Half an hour after preorders went live, Apple Watch launch supply is nearly depleted, though 38mm Apple Watch Sport showing availability for April 24 shipment. According to the Online Apple Store, 42mm Apple Watch Sport and mid-tier Apple Watch models ship in four to six weeks, as does the 38mm stainless version. Space Gray stainless steel Apple Watch models have been pushed to June and both rose gold Apple Watch Edition variants now ship in July. MacBook availability remains high and only spec'd out gold versions have been pushed out three to four weeks.